Travel is one of those things that naturally gives rise to queries, concerns and doubts, so we’re here to put your mind at ease. When is the best time to visit Myanmar? What do I do about visas? How much do I tip? You can always contact to us info@myanmarshalom.com for any other questions not mentioned here. Do we need visa to visit Myanmar? Yes, any foreigners (except some Southeast Asia counties) visiting Myanmar need to have a entry. Your passport must have at least 6 month. You can easily apply visa online and it will usually take 3-5 Days at: http://evisa.moip.gov.mm. If you prefer to apply at the Embassy – you can do so and you will need to contact the Myanmar Embassy in your country of origin to arrange your visa. We can supply all necessary information. The best time to visit Myanmar? Myanmar has three seasons. *Cool Season – October through February with average temperatures 20-24 C *Hot Season – March through May with average temperatures 30-35 C *Wet Season – June through September with average temperatures 25-30 C. The ideal time to visit Myanmar is between October to March. We recommend all clients to obtain the necessary personal baggage, medical and accident insurance before arrival. Communications: can I make international calls and use email? All of the hotels that we use provide international telephone, fax and postal services. However call rates can be quite expensive. Internet access is readily available in Myanmar. Electricity: what sort of power adaptor should I bring? Myanmar uses 220-230 Volts AC. AC (50 Hz) electricity. We suggest bringing a universal power adapter with voltage converter. Tipping is becoming more customary in Myanmar. If you would like to express your gratitude to a waiter, porter, guide or driver, feel free to show them your appreciation by giving them tip – you can be sure that they will be very grateful for it. Is safe to drink water? We strongly suggest drinking purified bottle water. Bottled water is readily available and hotels provide complimentary. Myanmar Shalom will provide you with drinking water bottle inside the car. No immunizations are required for regular route tour of Myanmar, but it is suggested that you should check with your doctor and CDC website. It is wise to bring an insect repellant against mosquitoes. Myanmar Shalom strives to undertake everything reasonably possible to provide the best service to its clients. Myanmar Shalom serves as an intermediary and/or agent for airlines, hotels, transport operators and various tourism firms that make up a tour package. The company will not be held liable for any loss, damage or additional expense that the client may experience. Additional expenses or loss relating to delay, accidents, natural disasters, political unrest or other causes beyond the company’s control are the responsibility solely of the client. 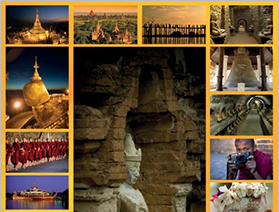 All cancellations must be made in writing and acknowledged by Myanmar Shalom Travels. How can I settle the payment for the tour I have booked?